How to play Three-Eyed Bingo? What is "3's A Crowd"? How do I close the eyes that are following me around? Watch the small, animating pattern in the upper left part of the game screen to see the full pattern you need to match. In this example, the pattern for the game is S-O-S. That means on card #1, you must complete the "S" pattern. On card #2, you must complete the "O" pattern. And on card #3, you must complete the "S" pattern. 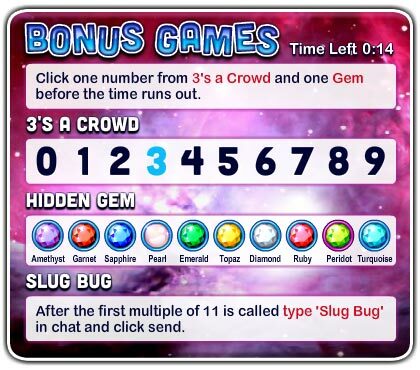 At the start of each round, you have the chance to choose one number and one hidden gem which will be used in a special chat game for bonus GV Rewards (see details below). If you enter the current game late, you won't be able to make picks that game. However, you will before the next game begins. Use your mouse to check off the numbers on your cards that correspond to the numbered balls shown on our bingo board. When you click on a square on the bingo card, it will display a daub mark to show it has been checked. You can remove the daub mark by clicking on the square a second time. To win, check off the specified patterns on all three bingo cards, then click the "Bingo!" button. The patterns you need to check off are printed on BLUE on each of your cards, and the pattern may be different from each card. For example, the pattern on Card #1 might be "S", the pattern on Card #2 might be "O", and the pattern on Card #3 might be "S". The status bar beneath each card tells you what percentage of the card you have validly checked off. When you have 100% on each card, click the "Bingo" button to claim your win. Win bonus GV Rewards by daubing numbers that match the gold bingo balls! You may check off numbers that are not in the pattern (for example, to claim gold balls that fall outside the pattern). This will not prevent you from winning. But be sure the winning numbers are all checked off before clicking "Bingo!" One new bingo ball is available and automatically displayed every few seconds. The game ends after 60 bingo balls have been dropped, whether or not there is a winner. 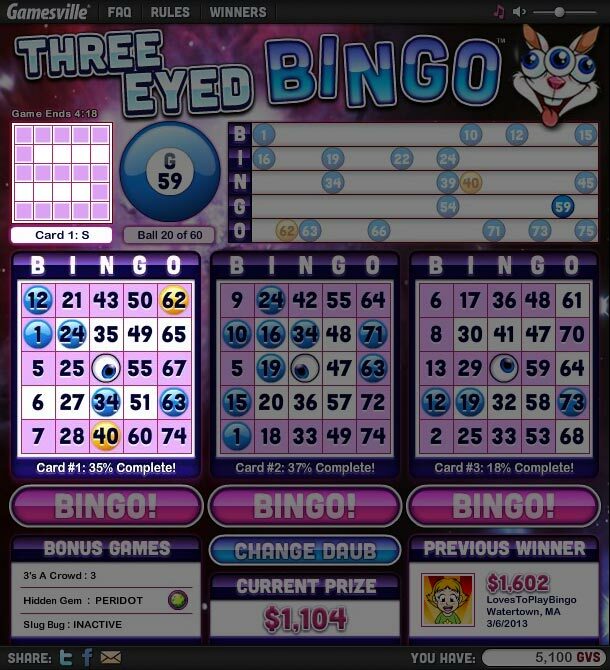 Three-Eyed Bingo runs around the clock, 24 hours a day, seven days a week. 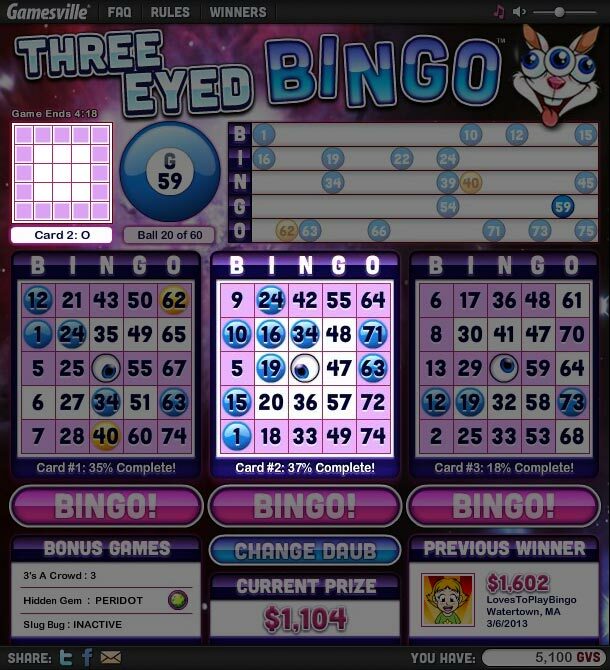 Three-Eyed Bingo features three optional chat games that can be played alongside the main game. "Hidden Gems is one of these chat games. Each gem type is worth a different amount of GV Rewards. At the end of each game, Dickie will open the treasure chest and select a gem. This is the Hidden Gem. All players who selected the winning gem wins the associated GV Rewards amount. 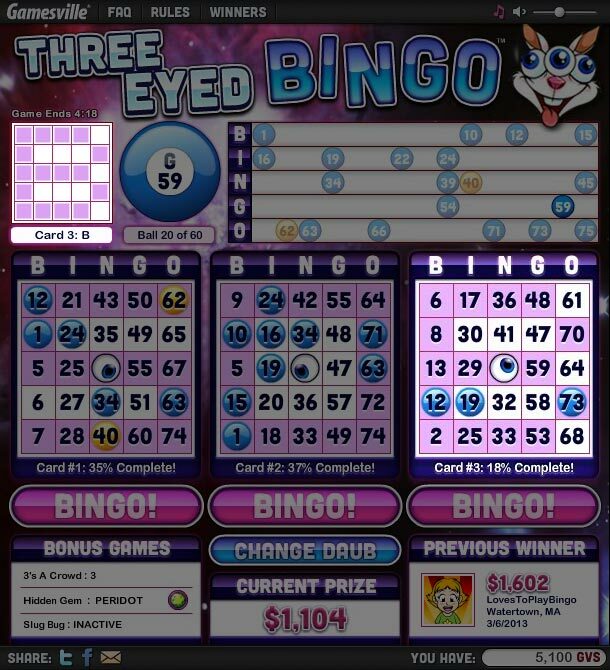 Three-Eyed Bingo features three optional chat games that can be played alongside the main game. "Slug Bug" is one of these chat games. Watch the bingo board for the first double digit to be called (eg, 11, 22, 33, 44 etc). All players who type 'Slug Bug' in chat and click send BEFORE the next new number is called win 33 GV Rewards! 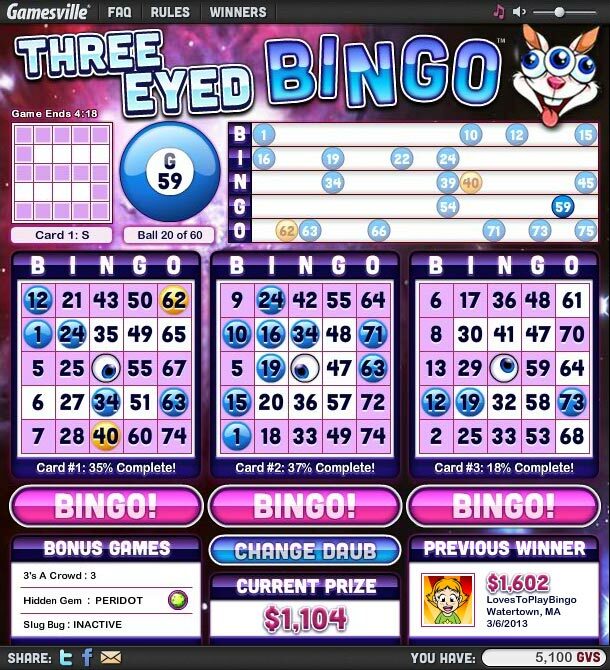 Three-Eyed Bingo features three optional chat games that can be played alongside the main game. "3's A Crowd" is one of these chat games. This is your 3's A Crowd number. All players who selected the right number and send the correct message receives 333 GV Rewards.